Brandon McCarthy: Mechanical changes for the better? 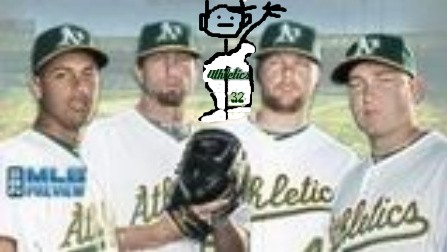 Brandon McCarthy has made some major changes in 2011 while pitching for the Oakland Athletics. Jeff Sullivan noticed this on Baseball Nation, referring to the change in his arm slot. I took a look at one of his older starts on July 31, 2007 (Texas @ Cleveland) and compared it to a game I went to in Seattle on April 21, 2011. Here’s the raw PITCHf/x data from those two games via BrooksBaseball.net: 2007, 2011. You can see in the 2007 data that he threw a four-seam fastball that was primarily higher in the zone with little lateral break (consistent with a higher release point), while in 2011 he relied more on a two-seam fastball with larger lateral break and more sink (consistent with a lower release point). 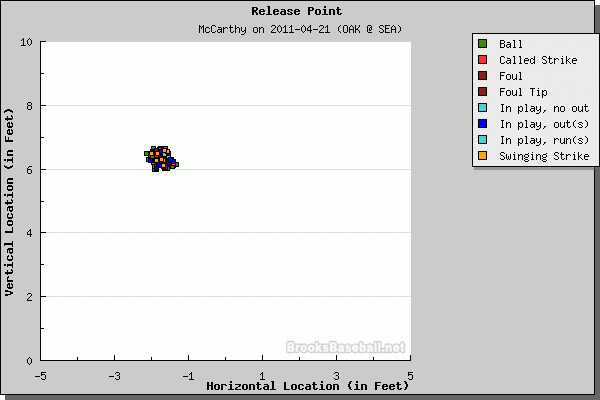 His release point appears to be more consistent in 2011, which may be a good thing with regard to limiting elbow injuries (though McCarthy’s injury problems have been shoulder/scapular in nature). While it’s pretty rare to find a pitcher who has made such major changes in approach and arm angle in the major leagues, it’s even more rare to find someone who has made whole cloth mechanical changes in addition to revamping how he attacks hitters. Simply pause the video at footplant to see the major changes in how he loads the scapula. More careful examination will reveal that he is using his lower body more efficiently and effectively in the newer video than he was in the 2009 video. 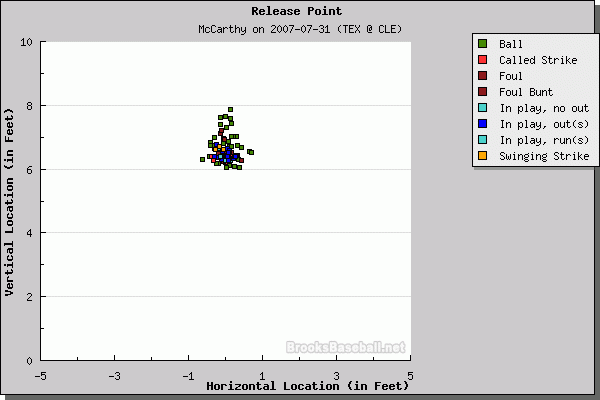 To use common scouting language, McCarthy is a lot less “max effort” in 2011 than in 2009 without any detrimental effects (no drop in velocity). In my opinion, McCarthy’s new delivery is a huge upgrade on many levels. He’s obviously getting much better results with it, but the new delivery promotes rotation significantly better by doing a superior job of finishing rotated to the target while his trunk is “stacked” more efficiently. He is “loading” his scapula in a better pattern, which may help to limit injury given his history of scapular stress fractures without any loss of velocity. We know that McCarthy has worked with a number of people on revamping his mechanics, including his former pitching coach in Texas, Mike Maddux, and TexasLeaguers.com writer (and current pro scout) Trip Somers (source: scout.com). He pitched a brilliant game (albeit against a mostly inept offense) when I saw him, losing 1-0 against Felix Hernandez. It’s hard not to root for a guy who is willing to put in the work and research to stay in the big leagues, and the fact that he pitches for a team I have a casual rooting interest in makes me hope McCarthy puts together a great career going forward. Congrats on landing the gig at Hardball Times. 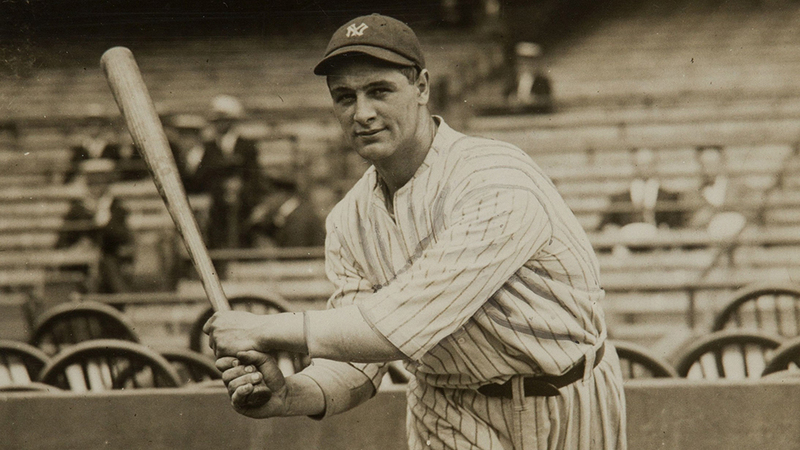 You have posted some great info on Driveline Mechanics. I am going to become a regular on this site now.